Gator, a winter visitor to Blue Spring State Park, is also small in size. His playful behavior is frequently noted, which is how he got his name! In January, Save the Manatee Club (SMC) added two new manatees to the Adopt-A-Manatee program. The most recent adoptees are named Electra and Gator. Electra is a resident at the Ellie Schiller Homosassa Springs Wildlife State Park in Homosassa, Florida, and Gator is a winter visitor at Blue Spring State Park in Orange City, Florida. Gator investigates a turtle at Blue Spring. Sadly, his scars from two boat hits make him easy to identify. When Gator was a young, juvenile manatee, he was captured on Save the Manatee Club’s webcam chasing and playing with an alligator at Blue Spring State Park. From then on, he was known as Gator! People often think that alligators may be a threat to manatees, but an alligator has never been observed behaving aggressively toward an adult manatee. 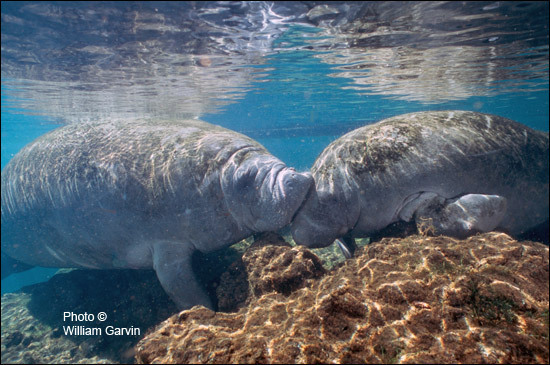 In fact, sometimes it’s the manatee that initiates the interaction. That curious manatee would be Gator. Although the exact date of Gator’s birth is not known, it is believed he was among a group of unidentifiable yearling manatees seen at Blue Spring during the 2010-2011 winter season. Manatee researchers use scars to identify manatees, and unfortunately, Gator is easy to identify. He has six large propeller cuts from a boat hit down his right rear side. Sadly, Gator was hit by a boat again at the end of January 2012, and his new scar consists of three propeller cuts and a large skeg cut — almost in the exact same location as the previous scar. Wayne Hartley, Save the Manatee Club’s Manatee Specialist who tracks the manatees at Blue Spring, describes Gator as “a bit of a runt.” Gator is small in size. His playful behavior is frequently noted, both by researchers at the park and as seen on webcam footage. Electra and Gator are ambassadors for all manatees, and when you adopt one of them, you are helping all manatees to survive. 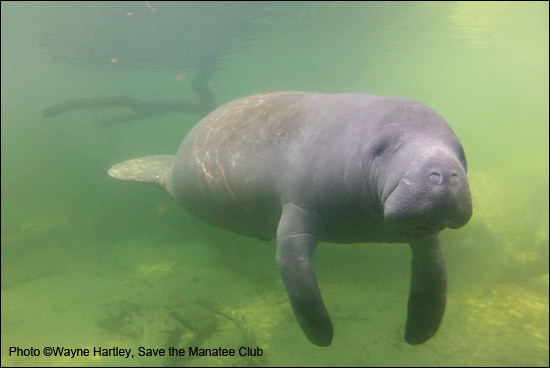 Each person who adopts Electra or Gator will receive a full-color photo, biography, and adoption certificate, as well as a membership handbook and subscription to The Manatee Zone, a newsletter featuring updates on the adopted manatees when they are sighted, and Paddle Tales, SMC’s bi-monthly e-newsletter. For more information about adopting Electra or Gator, go to Save the Manatee Club’s Adopt-A-Manatee page, or call 1-800-432-JOIN (5646). A memorial adoption for Rosie is also available for new and renewing members. When Electra first arrived at the park, she bonded with Rosie, another Save the Manatee Club adoptee. Here they are together as Rosie (at left) nuzzles Electra’s head. 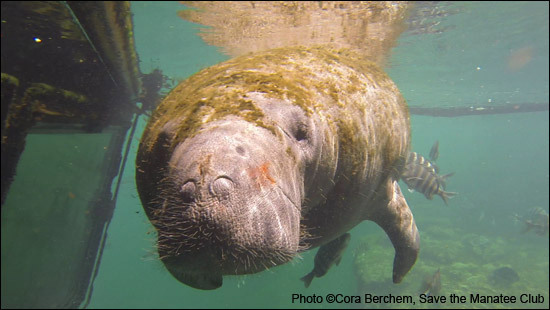 Sadly, Rosie passed away in December 2015 of natural causes due to her advanced age, but Electra still lives with Lorelei and Ariel, two other manatees at the park. Adopt Electra and Gator now or choose a memorial adoption for Rosie. 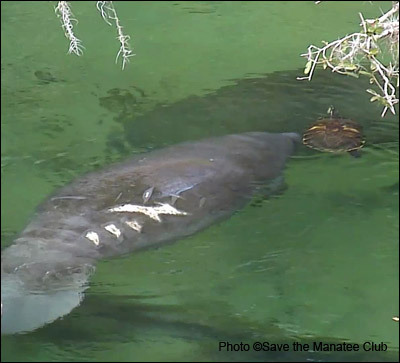 Watch Manatee Webcams at Blue Spring State Park. Discover Blue Spring State Park. Learn more about the Ellie Schiller Homosassa Springs Wildlife State Park.